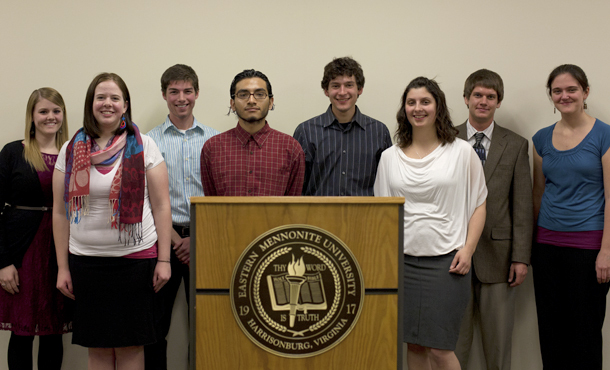 Peace and the U.S. presidential election would not seem to be partners, yet an Eastern Mennonite University student made a winning case for joining them during the annual C. Henry Smith Oratorical contest. Emily Harnish, a senior biochemistry major from Strasburg, Pa., won first place with her speech, “Lessons from the hymnal in an election season.” In her speech, Harnish explains her anger over the non-peaceful manner of politics during the 2012 election and how the hymn, “Let All Mortal Flesh Keep Silence,” made her think about peace in a new way. “When I remember that my citizenship is in heaven, I am able to look past disagreements about politics,” said Harnish. As a first-place winner, she will receive a cash prize and entry in the bi-national competition with winners from other Mennonite colleges and universities in the United States and Canada. “At least 43 percent of American Muslims undergo some form of discrimination or violence because of their religion every year. And while they only make up one percent of the American public, American Muslims are victims of 13 percent of hate crimes in the U.S. 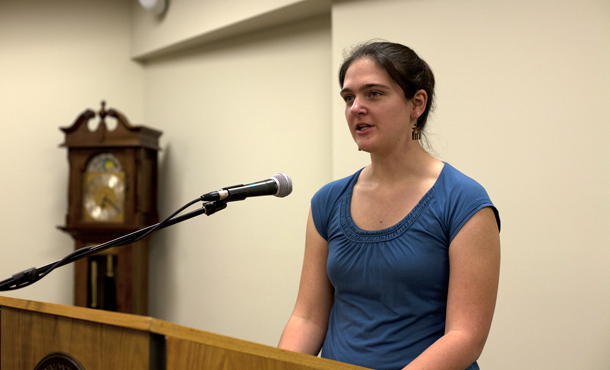 The annual oratorical event, open to students in Mennonite and Brethren in Christ universities and colleges in Canada and the United States, is administered by Peace and Justice Ministries of Mennonite Central Committee (MCC) U.S.
Each speaker applied the Christian peace position to a contemporary concern in an 8-10 minute address. The contest was established in 1974 in honor of the late C. Henry Smith, a Mennonite historian and professor at Goshen College and Bluffton University.